Brazilian police have arrested Rodrigo Rocha Loures, a former congressman and close friend of President Michel Temer. 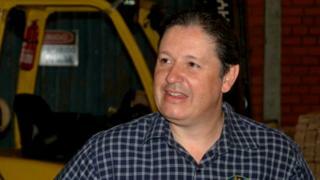 Mr Rocha Loures was seen in a video released in May carrying a bag with 500,000 Brazilian reais ($154,000). His arrest comes as part of a probe into alleged payments to politicians by the meat-packing company JBS. The owners of J&F's, the controlling shareholder of JBS, said under a plea bargain that they spent 600m reais ($184 m) to bribe nearly 1,900 politicians over a number of years. One of them, Joesley Batista, also gave prosecutors an audio tape, leaked to the media, in which Mr Temer appears to condone bribing a witness. The audio came from a conversation between the president and Joesley, and was recorded using a hidden device. In it, Mr Temer appears to discuss paying for the silence of politician Eduardo Cunha, who is currently in prison. Mr Temer has said the recording is genuine but may have been tampered with. He says it was taken from a meeting in March and he denies any wrongdoing. "I never authorised any payments for someone to be silent," he said in a televised address. "I did not buy anyone's silence. I fear no accusations." Mr Temer has resisted calls to step down over the scandal. The country's Supreme Court has approved an investigation into the allegations against the president. Mr Rocha Loures could seek a plea bargain and reveal who the money was intended for, BBC Brasil correspondent, Julia Carneiro, says. But that could damage the president's assertion that he did nothing illegal, she adds.